The Aquarius decanate of Libra differs somewhat from the other decanates of this sign in the strong tendency to express individuality. Being under the sub-influence of Uranus, it partakes of the Uranian quality of originality and sometimes even eccentricity. It is pictured among the constellations by DRACO — the Dragon — which winds its length in sinuous coils about the heavenly pole. S.J. Paul Kruger, Boer President, who struggled valiantly for the liberty of his people had his Individuality in this decanate. Magi Zariel, largely responsible for founding the National Astrological Society, and for 25 years editor of its official organ, “Prophecy,” was born with his Mentality polarized in this place. And W. H. Chaney, author of “Primer of Astrology,” who fought energetically in defense of astro-science, was born with this part of the heavens on the Ascendant. It is the decanate of INDEPENDENCE. 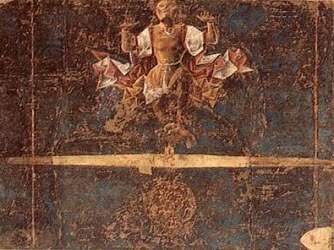 Two men furious and wrathful and a man in a comely garment, sitting in a chair; and the signification of these is to shew indignation against the evil, and quietness and security of life with plenty of good things. Disruption, interruption, separation, quarrelling; sowing of discord and strife, mischief-making, sorrow and tears; yet mirth in Platonic pleasures; singing, faithfulness in promises, honesty in money transactions, selfish and dissipated, yet sometimes generous: deceitful in words and repetitions; … (Unhappiness, sorrow, and tears). Keywords: Tears, emotional suffering, emotional pain, sorrow, intense pain, worries, love triangle, separation. Ill-Dignified: healing, deep sympathy, disorder, confusion, loss but not as extreme as upright. Interpretation: Relationship is causing deep emotional pain. Surgery. Emotional wounds. Divorce. Abuses, transgressions. Relationship crisis. Very destructive relationship. 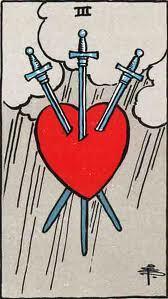 Reversed Interpretation: Recovery from emotionally painful relationship or triangle. May be involved in a very difficult relationship and doesn’t realize ending won’t be as painful as he things. May recover quickly. Deep sympathy for those in pain. Alan Leo: This is a very favourable ascendant, especially for those who can rise to that point where response may be made to the highest vibration that it produces. It will give the native a much firmer and more stable frame of mind and cause him to become social, independent, and free; for it awakens and liberates a more social and artistic condition, hitherto more or less latent. He will now make some lasting and faithful friendships, and also form attachments that will be very helpful and beneficial to him. His mentality will become more refined, and inclined towards the more metaphysical and subjective types of study; and if he can abstract the inner virtue of this decanate he will find it leading him to the study of higher thought and occult or mystical subjects. To the very progressive it brings associations with groups of persons, societies and public gatherings, and awakens the truly humanitarian side of the nature. The native will be able to study and comprehend character and human nature with ease if he develops the best side of this influence. He will be pure-minded, have potent desires, and make much progress in purity of thought and refinement 01 expression during the time that this decanate occupies the progressed ascendant.